On Monday, January 8, 2018, the Second Regular Session of the Sixty-fourth Idaho Legislature convened. 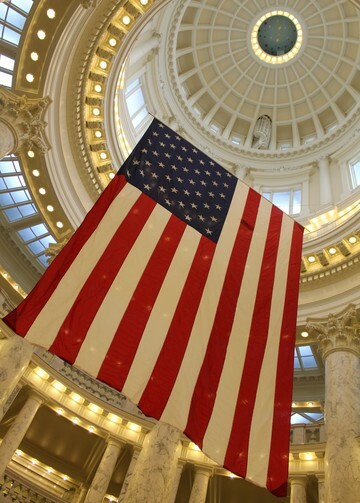 Lawmakers and the public were greeted on the first day of the session by a U.S. flag posted in the rotunda of the Idaho State Capitol. The majestic flag is approximately the height of two floors of the Capitol building. 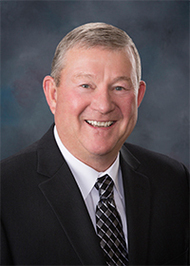 Governor Butch Otter delivered his “State of the State” message to a joint session of the Idaho legislature on Monday, January 8, 2018. “The state of Idaho is prosperous, positive, and poised for even better times ahead,” Gov. 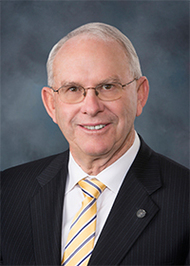 Butch Otter told a joint session of the Legislature today as he began his 12th and final State of the State message and released his budget for the coming year, which includes proposed tax cuts. Click here for the full story. Members of the Idaho Association of Soil Conservation Districts (IASCD) came to the capital this week and educated lawmakers about their organization. The IASCD's mission is to represent Idaho’s conservation districts as the primary entities to coordinate voluntary, locally led efforts to sustain and enhance Idaho’s natural resources, and strengthen Idaho’s conservation districts and thereby the non-regulatory approach to conservation. They believe in strong, independently lead conservation districts fully exercising their role to lead non-regulatory conservation efforts throughout the State of Idaho. HB 335, legislation that over the next three years would save Idaho employers approximately $115 million, passed the House unanimously this week and is now in the Senate for consideration. The bill lowers unemployment insurance taxes which are paid by Idaho businesses by adjusting the employment multiplier down. Lawmakers are working to pass the bill early in the session because businesses will start to pay this tax in the first quarter of this year. By having this legislative change in place, businesses will know what their adjusted rates will be for the coming year. We are told no matter how good the medical advice is, always get a second opinion. With that in mind, the budget committee has begun to do a thorough examination of Governor Otter’s budget presentation. We began the annual session with the longest presentation I can remember. This will be his last opportunity to place his hopes and plans for the state in play, and after the long climb back from the 2009 depression, the economy appears to be on a steady growth cycle. One word of caution here, however, I have been in the legislature long enough to know that economic cycles, no matter how strong they appear, are not always permanent. That is not to say there are many worthy ways to help the citizens of Idaho, and the Governor included a very good plan for lowering our taxes along with the support of the needed areas in education, safety, and economic development. As we take each area into study and before the first dollar is placed to be spent, the federal fiscal picture is always before us. The revenues for the payment of state taxes came in almost fifty million over projection for the amount expected for December, Because of the uncertainly of the federal changes, the tax experts feel that many are paying taxes before they are due and some changes are coming. If that is the situation, instead of the month of April being our largest collection, it could be the month when all those who overpaid will be requiring the refunds. And of course, we would be wise not to have spent the income. One item does seem to be secure, as we conform to the new federal tables, we will be to the good about 100 million dollars that can then be added to and turned back to the tax payers in Idaho with the same amount in state revenue. While our tax burden is relatively light compared with other states I and many others serving here would be grateful if we can drop our rates and return some hard earned wages to those who earned them. Last year when the revenue came in ahead of the projection, we were able to divert it to the heavy snow and flood damages in our state. It is too early in the session to have any bills come to the floor that may be of interest to you, more of those later. For now, my major committee is listening, and sifting, and watching the tax picture. There are funding needs in infrastructure, our schools, and health care. The prison and jail population have blossomed, and those who need help from Medicaid has grown. The growth of new students in our schools continues, and the roads still need repairs. These issues will be weighed and we will find a way to address each need as the days go by. I look forward to keeping in touch as the work progresses and would be happy to hear from you on any concern. This year I am serving on the same committees that I served on last session. Revenue & Taxation, Transportation & Defense and Resources & Conservation Committees. The first week of the session was getting organized and reviewing rules. Rules review is an important function of the legislature to insure the implementation of laws passed last year follow legislative intent. The rules review usually take a week or two, but at the same time bills are being drafted and start the process of becoming law or dying. This week I signed up for the “Steps for Schools” sponsored by Blue Cross. In February if I average 10,000 steps a day, I earn $500 for playground or physical activity equipment for one of the elementary schools in District 25. 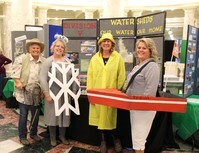 This is a competition with fellow legislators and this is the fourth year that I have participated. At the end of February, Representative Bell and I have a drawing to choose the school to receive the money. 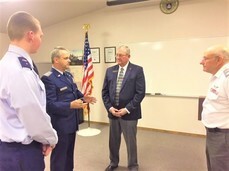 On Sunday evening I had the honor of attending The Twin Falls Composite Squadron, Civil Air Patrol. The Civil Air Patrol is the official auxiliary of the United States Air Force and has three primary missions: Aerospace Education of the American people, Emergency Services, and the Cadet Program. One of the cadets, C/2nd Lt Wesley LaFleur has worked his way up through the ranks and has reached a Mile Stone Award, the GENERAL BILLY MITCHELL AWARD. I was invited participate in the awards ceremony by presenting the General Billy Mitchell Award to Wesley. The Cadet Program provides opportunities for the learning, maturing, accepting, and nurturing of leadership to over 26,000 young Americans from 12 to 20 years of age. Cadets are exposed to a structured program comprised of aerospace education, leadership, special activities, physical fitness, and moral and ethical values through group and individual activities. On Monday we celebrated Martin Luther King Day at the capitol. 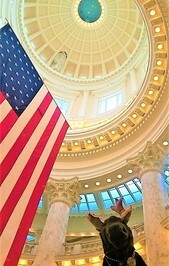 The ceremony, themed “Find Common Ground,” opened with trumpeting from Boise State University trumpeters with the pledge to the flag, with a giant American flag hanging in the middle of the Capitol rotunda. On Tuesday the Idaho House voted unanimously – 69-0 – in favor of HB 335, to cut unemployment insurance taxes for Idaho employers due to a growing reserve fund. The bill cuts the divisor that determines the base rates for unemployment insurance tax from 1.5 to 1.3 and will save employers $115 million over the next three years. This week I was one of 55 House members who received the Ag All Star award for my voting record last year on issues supporting the agriculture community. I also met with the VFW/ American Legion, members of the Idaho Cable Broadband Assn., the National Federation of the Blind, Idaho Association of Soil Conservation Districts, the Idaho State Pharmacy Assn., the Idaho State Broadcasters Assn. and Midas Gold. 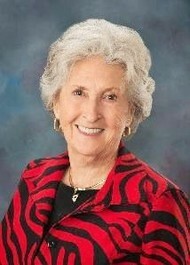 I am honored to represent District 25. 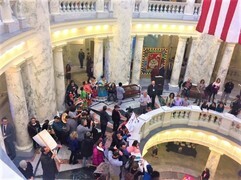 This week Hemmingway, the friendly moose mascot of the Idaho Commission for Libraries, snapped a few selfies in the Rotunda of the Capitol while educating lawmakers and the public about the duties of the commission. The Idaho Commission for Libraries assists libraries throughout the state to build the capacity to better serve their communities. 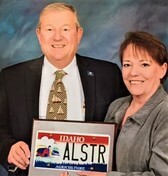 It provides access to the Libraries Linking Idaho program, (LiLI), which is a group of projects and services that bring networked library service to the residents of Idaho.